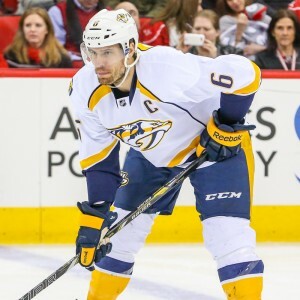 Defenseman Shea Weber may not be Montreal’s most important player. He does rank way up there, though. And, while both he and Carey Price are currently holding down the defensive fort for Team Canada at the World Cup before training camp technically starts to shake off any rust ahead of time, Price doesn’t need to impress anybody. Weber may be a proven talent as well, but not to the fickle fan base in Montreal who saw the beloved P.K. Subban traded away to secure his rights. He may be 6 foot 4, but he has big skates to fill. Oh, it’s undeniably only a matter of time before Habs fans come around in regard to his game-breaking (and bone-breaking) talent, but getting off on the right foot certainly couldn’t hurt… unless we’re talking about the guy he hits. In the minds of many Canadiens fans, it’s almost a foregone conclusion Artturi Lehkonen will end up in the top six (in spite of early projections by head coach Michel Therrien indicating otherwise). He may very well not secure that coveted roster spot, but if he doesn’t earn one at all… well, it’s Montreal or bust for the 21-year-old left-winger. Lehkonen’s specific contract situation will see him return to the Swedish Hockey League and not be demoted to the American Hockey League if he doesn’t make the team out of training camp. It wouldn’t necessarily be the worst thing and he seems upbeat about either option, calling it a win-win, having just set a new Frolunda team playoff scoring record. Nevertheless, losing out on making the Canadiens would cost him a year of adjusting to the North American game. Montreal may not be going anywhere, but he could be, and that would be a shame, considering his talent. 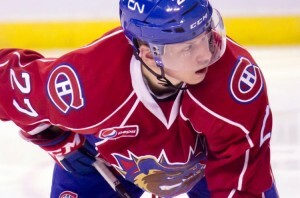 Montreal Canadiens defenseman Mikhail Sergachev – Photo by Terry Wilson / OHL Images. Similar to Lehkonen, 18-year-old defenseman Mikhail Sergachev is in a unique can’t-lose situation. Either he impresses team management and forces the Habs to keep him around, or he goes back to junior to compete for a national championship, with his Windsor Spitfires set to host next year’s Memorial Cup. Of course, most sane 18-year-old hockey players would prefer the former option to stick around. And many onlookers might hold it against any rookie if they held any other opinion (much like they did relative to Max Pacioretty back in the day). The argument is Sergachev’s development would probably be better served with a trip back to junior, where he should dominate the Ontario Hockey League. It would beat getting bottom-pairing minutes in Montreal, that’s for sure. The counter-argument is that Sergachev could theoretically step in and play with Weber on the team’s top pairing, which is an intriguing possibility. It’s just an improbability, because of Montreal’s need to compete for the Stanley Cup right now. Asking an 18-year-old to play top-pairing minutes, under those circumstances, is asking for trouble. While rumors are circulating in regard to Nathan Beaulieu’s future with the team, cooler heads should ultimately prevail, making him the logical front-runner for that spot beside Weber. That doesn’t mean Sergachev can’t make it an extremely hard decision on Montreal, though. 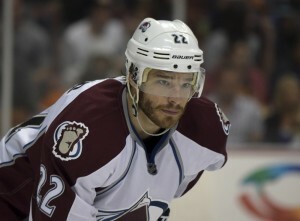 In many ways, Zach Redmond is the Mark Barberio of this year. The only difference is, while Barberio signed a two-way deal last offseason only to ultimately prove himself thanks to the team’s injury situation, Redmond’s contract is one-way. Not only that, but his contract is for two years, indicating more of a commitment from the team than Barberio got initially. Considering Redmond’s attractive underlying stats and how well Barberio worked out for them, it’s hard to argue with the logic there. Nevertheless, Barberio earned himself his own two-year, one-way deal this past summer. So, unless the Habs are willing to carry two extra defensemen (and just one extra forward), one is destined for the minors (or another team via waivers). Barberio must have the inside track to that depth-defenseman spot, having played admirably through 30 games last season. That makes it his spot to lose and Redmond’s to gain. In an ideal world, the Canadiens would be able to send Sven Andrighetto down and give him the minutes he deserves, without the risk of him being picked up on waivers. Of course, in an ideal world made up of sunshine and lollipops, goalie Carey Price wouldn’t have gotten injured last season and then led the Habs to their 100th odd Stanley Cup. Alas, it wasn’t meant to be. And Andrighetto is a victim of Montreal’s improved depth on the wings, with Alexander Radulov, Andrew Shaw and potentially Lehkonen being added to the roster. While he could conceivably play his way to a permanent spot on the third line, he’s in competition with the latter two for a precious bottom-six spot. From a pure asset management standpoint, it makes more sense to keep Andrighetto around, at the expense of a guy like Daniel Carr, who is exempt from waivers. However, a successful training camp on Andrighetto’s part would go a long way towards making the Canadiens see the light there because Carr proved much more efficient with the puck and had been on pace for 20 goals before his season got cut short. The Habs just may have other ideas because of their rapidly closing championship window and decide to trade Andrighetto altogether instead of losing him for nothing. So, he isn’t just playing for a roster spot. He’s potentially playing for a spot within the organization.